The Cohoes-based ADG, which has been in the waterpark business since the 1960s, is set to unveil its latest creation in the Catskills in April. In the years since, I’ve gone to my fair share of waterparks, but all have had one common denominator: They’ve been enjoyed, outdoors, during the summer— yet as soon as the fall’s first frost has bitten, it’s been goodbye fun. The creative minds behind Cohoes-based Aquatic Development Group (ADG) don’t believe serious splish-splashing should be seasonal; in fact, they think that waterparks should be enjoyed year-round, even in the dead of a Siberia-grade Upstate New York winter. “How’s that possible?” you ask. ADG, a family business founded in the 1960s by Albany native Herb Ellis, has been at the forefront of global waterpark design, equipment, construction and technology for nearly six decades. It was in the early ’80s that Herb’s son, Ken, who’s now ADG’s CEO and Owner, first remembers accompanying his father to Europe to investigate the indoor waterpark phenomenon. Enclosed waterparks would take another 20 years to catch on in the US, but ADG was already a step ahead of the competition in terms of strategy and execution. “What we found very quickly was that if you give people an opportunity to enjoy waterparks on a year-round basis, they’ll turn visits into mini-vacations,” says Ken. Since then, ADG has worked on one-third of America’s waterparks—both indoor and outdoor—for big-time clients such as Disney, Hilton and Six Flags (its Lake George attraction, The Great Escape, has ADG to thank for both its Splashwater Kingdom and Lodge’s indoor waterpark). 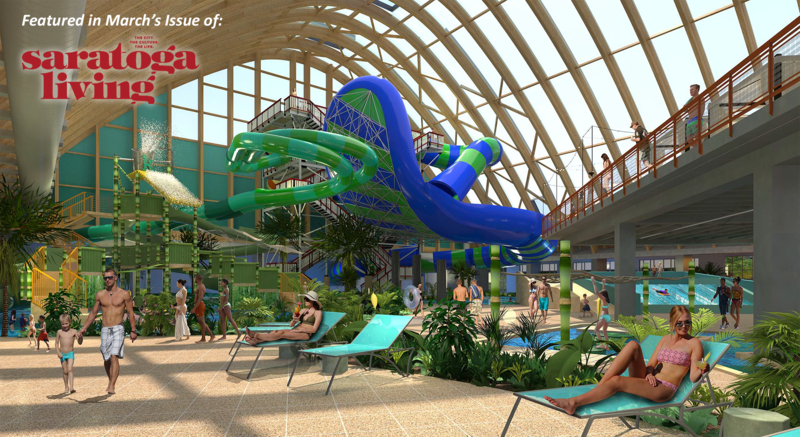 ADG takes a truly unique, all-encompassing approach to (indoor) waterpark design. As Ken describes it, ADG is not only building the park itself, but also creating its “environment.” (More on that in a minute.) On April 19, one such ADG-led project will be opening two-and-a-half hours from Saratoga Springs in the Catskills. A short distance from the Resorts World Catskills casino and resort and its Monster Golf Course, The Kartrite Resort & Indoor Waterpark in Monticello, NY, will be taking that environment-centric concept and running with it. ADG worked on both the luxury hotel and waterpark projects simultaneously, creating a flow between the two, so that patrons would feel like they were in a never-ending, Jumanji-style adventure. And because the focus is on a luxe experience, the waterpark will have a bit more of an adult-oriented vibe than your average family attraction. Some of the waterpark’s environmental features include an all-summer-in-a-day, 80-degree indoor temperature, with real tropical vegetation hither and yon; a lazy river; five waterslides; and the ADG-invented FlowRider® wave simulator, in which surfers can hang ten in a stationary ocean-within-a-pool. The park will also feature a boomerang-shaped mezzanine, positioned nearly 16 feet above all the action below, which will include an upscale bar and grill. All this talk of vacationing got me thinking about Amazon’s The Marvelous Mrs. Maisel, where a nice chunk of the current season’s action takes place at a summer retreat in the Catskills. Now, courtesy of ADG, all you upstart Mr. and Mrs. Maisels can enjoy a Catskills summer all winter long. Download a copy of this article today.